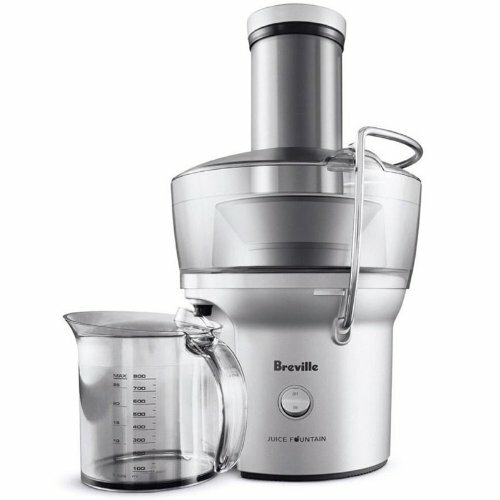 Make fresh juice in minutes with this compact juice fountain from Breville. This incredible 700 watt 5 speed juicer features a circular 3 inch feed tube to accommodate whole fruits and vegetables, centered dual knife blade assembly, stabilizing knife, internal pulp container, 1 liter juice jug with froth separator, cleaning tool, and a dual speed motor that can extract an 8 ounce glass of juice in approximately 5 seconds. The compact design collects pulp within the footprint of the unit to conserve counter space. This heavy duty machine is the perfect chef’s companion that you should have in your kitchen collection.